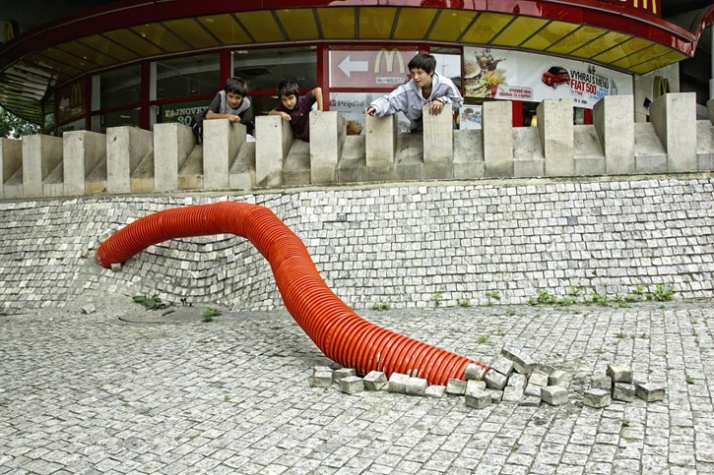 Czech artist known asEpos 257 has recreated a crypto-zoological creature, the Mongolian Death Worm, in his most recent installation Orghoi Khorkhoi. 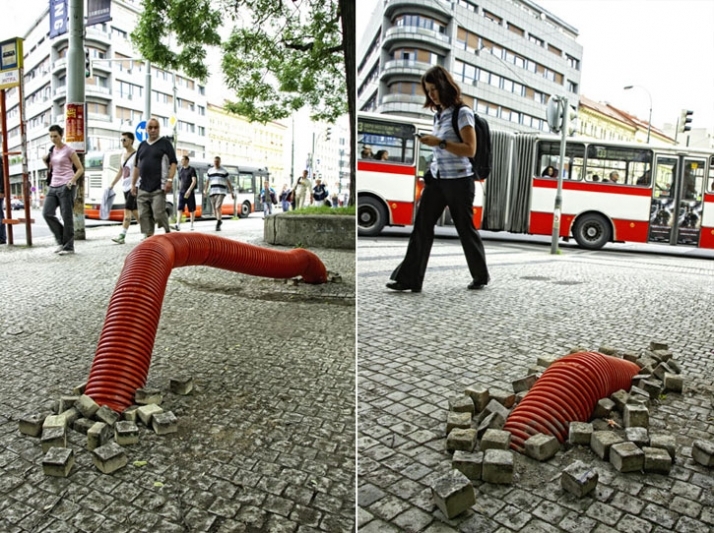 You can find the mythological worm diving in and out of Prague’s concrete sidewalks, streets, and walls, baffling curious young children and tourists. 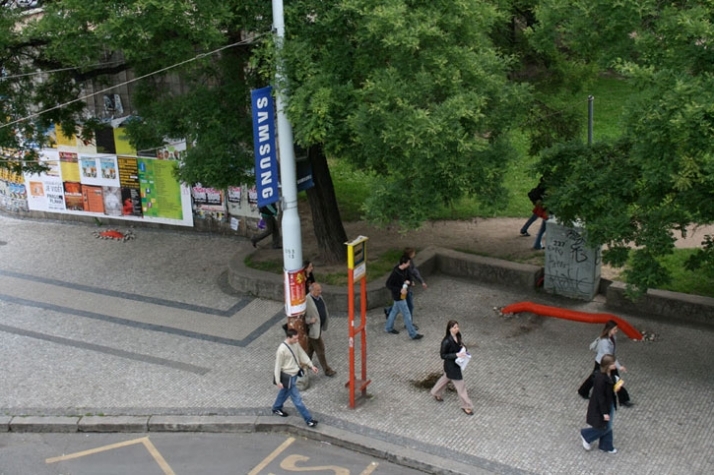 Epos 257’s inspiration for this project derived from his fascination by the construction work going on in Prague. It was on the city streets that he found the supplies needed, and reconstructed them in his studio. 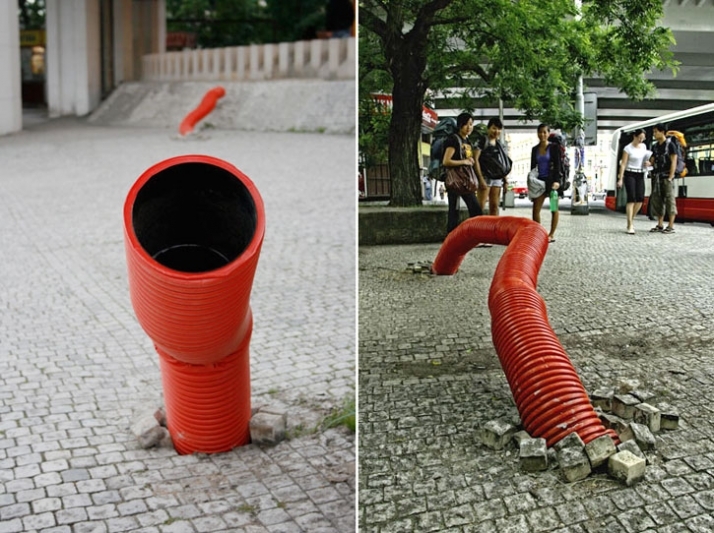 The artist’s first concept for the installation was to connect underground and ground level space in a symbolic fashion. “Orghoi Khorkhoi” stems from the local Mongolian name for this creature and literally means a blood filled intestine of a cow. 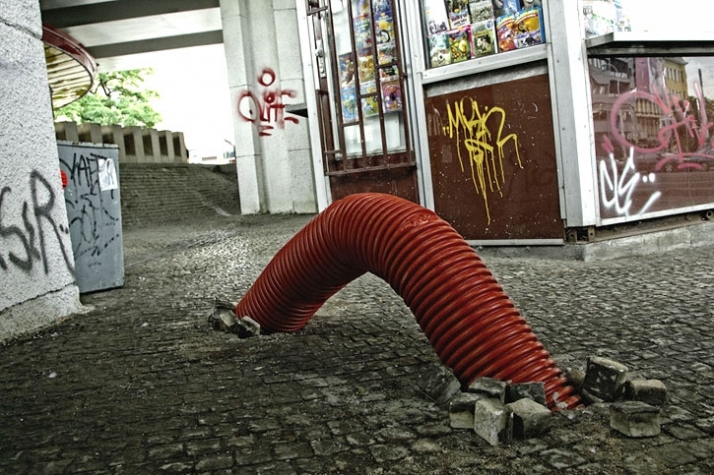 Though this worm has never been documented and confirmed to exist, locals insist that the 6-foot long worm spews victims with sulfuric acid and electrical charges (the red tubes in the installation are used for electrical cables). Epos began this project in the autumn, and installed Orghoi in June, when the Death Worms are thought to come out from their deep desert sand dunes. 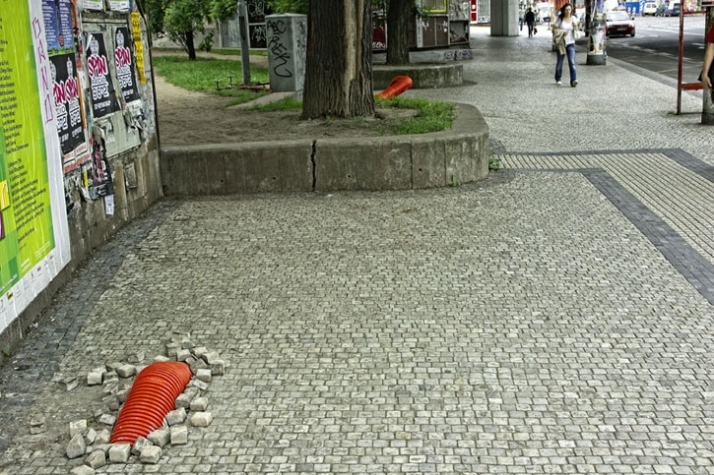 The 27-year-old artist is recognized for his bold urban exhibitions that dually create abstract pieces of art while making social, personal or political statements. The curiosity that surrounds EPOS 257’s projects forces the viewer to look twice, stretch the imagination, and dig deeper into what seems mundane. Much like a mythological story, different explanations and opinions surround Epos’s inventive, sometimes controversial, art.